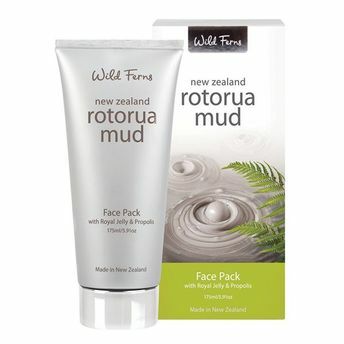 Wild Ferns Rotorua Face Pack with Royal Jelly & Propolis is a highly effective mud face pack that gives you the concentrated deep cleansing, antiseptic and healing properties of Rotorua geothermal mud, enhanced with the natural antibiotic and anti-inflammatory properties of Propolis and restorative qualities of Royal Jelly. Royal Jelly has beneficial antiseptic properties which help with the management of blemish prone skin. This unique blend of ingredients helps to heal, smooth and rejuvenate your complexion. This face pack also contains the absolute maximum content of Rotorua geothermal mud in its purest form, which is full of highly concentrated natural minerals, therefore making it particularly beneficial for a face, hand, foot or all over body treatment.